SAN FRANCISCO, July 10, 2018 /PRNewswire/ -- EnSync, Inc. (NYSE American: ESNC), dba EnSync Energy Systems, a leading developer of innovative distributed energy resources (DERs), business models and controls, announced today that the company will feature an interactive livestream at Intersolar North America of a system running the EnSync Home Energy System (EnSync Home), which includes solar, energy storage, power electronics and an Internet of Energy control platform. Booth visitors will be able to clearly visualize different optimized settings and the automatic energy flow of an intelligent distributed energy resource in real-time across five assets, including the utility grid, a simulated home load, solar generation, the True Peer-to-PeerTM DC-LinkTM and the Wisconsin-based EnSync Home system. They will learn how the system's DC-link connects individual residential units in a multi-unit property complex to enable peer-to-peer energy exchange, improves solar energy economics and optimizes energy utilization. "The innate desire for greater individual control and flexibility has created megatrends across industries like ridesharing and hospitality thanks to new technologies and business models that can deliver on making it a reality," said Brad Hansen, president and CEO of EnSync Energy. "Residential energy is poised to be another market to experience that massive disruption as homeowners seek energy independence from the utility grid. EnSync will play a vital role in driving and capitalizing on this megatrend. 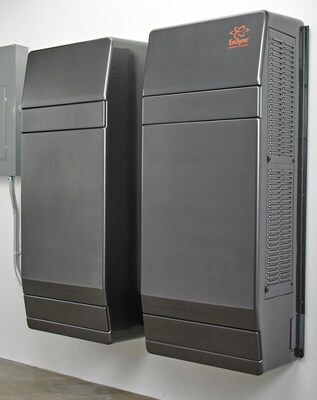 Visitors to our booth can learn how the EnSync Home Energy System changes the game for residential energy, whether for an individual home or a property complex with several units connected on our DC-Link." Intersolar North America will take place on July 10 through 12 in San Francisco. Conference attendees can visit EnSync at booth #8119 to see and interact with a graphic user interface and the livestreamed data. On the main dashboard, the interface will show the real-time flow of energy between the five assets. Users can click on a specific asset to see its activity over time and how it compares to other assets. EnSync's booth will also feature various hardware components of the EnSync Home system, including the power electronics and battery enclosure. This press release contains forward-looking statements within the meaning of Section 27A of the Securities Act of 1933, as amended, and Section 21E of the Securities Exchange Act of 1934, as amended, that are intended to be covered by the "safe harbor" created by those sections. Forward-looking statements, which are based on certain assumptions and describe our future plans, strategies and expectations, can generally be identified by the use of forward-looking terms such as "believe," "expect," "may," "will," "should," "could," "seek," "intend," "plan," "goal," "estimate," "anticipate" or other comparable terms. All statements other than statements of historical facts included in this press release regarding our strategies, prospects, financial condition, operations, costs, plans and objectives are forward-looking statements. Examples of forward-looking statements include, among others, statements we make regarding project completion timelines, our ability to monetize our PPA assets, statements regarding the sufficiency of our capital resources, expected operating losses, expected revenues, expected expenses and our expectations concerning our business strategy. Forward-looking statements are neither historical facts nor assurances of future performance. Instead, they are based only on our current beliefs, expectations and assumptions regarding the future of our business, future plans and strategies, projections, anticipated events and trends, the economy and other future conditions. Because forward-looking statements relate to the future, they are subject to inherent uncertainties, risks and changes in circumstances that are difficult to predict and many of which are outside of our control. Our actual results and financial condition may differ materially from those indicated in the forward-looking statements. Therefore, you should not rely on any of these forward-looking statements. Important factors that could cause our actual results and financial condition to differ materially from those indicated in the forward-looking statements include, among others, the following: our historical and anticipated future operation losses and our ability to continue as a going concern; our ability to raise the necessary capital to fund our operations and the risk of dilution to shareholders from capital raising transactions; our ability to successfully commercialize new products, including our MatrixTM Energy Management, DER FlexTM, DER SupermoduleTM, and Agile TM Hybrid Storage Systems; our ability to lower our costs and increase our margins; our product, customer and geographic concentration, and lack of revenue diversification; the length and variability of our sales cycle; our dependence on governmental mandates and the availability of rebates, tax credits and other economic incentives related to alternative energy resources and the regulatory treatment of third-party owned solar energy systems; and the other risks and uncertainties described in the Risk Factors and in Management's Discussion and Analysis of Financial Condition and Results of Operations sections of our most recently filed Annual Report on Form 10-K and our subsequently filed Quarterly Report(s) on Form 10-Q. We undertake no obligation to publicly update any forward-looking statement, whether written or oral, that may be made from time to time, whether as a result of new information, future developments or otherwise.